In the current high-tech welding industry, women make up only three to five percent of the workforce. Since 2010 industry articles have said that welding is one of the few steadily growing industries in the U.S. economy. One of those trailblazing women welders is Chrystal Atkins Gunn, raised in Jacksonville and a 1991 graduate of Jacksonville High School. Women are not totally new to the welding industry. Maybe not as famous as “Rosie the Riveter,” “Winnie the Welder” was the moniker given to the approximately 2,000 women who worked at U.S. shipyards on everything from ships to submarines during the World War II. But many gave up their jobs and returned to their homes after the war. Today, Gunn joins the ranks of those women working in this male-dominated industry and is flourishing and loving it. Gunn lives in Wellford, South Carolina, with her two sons, Brandon and Erik. Her parents are Tom and Jana Atkins of Jacksonville. Gunn has 22 years of experience in welding in the Spartanburg area of South Carolina. Upon moving to South Carolina in early 1995, Gunn said she didn’t know anything about welding. She was out of high school, moved to a new place, and didn’t know what she wanted to do for a career. She said, “I had a contact through a man who ran a local fabrication shop who told me Sanders Brothers was looking for people to work on a large project and needed a helper.” Sanders Brothers provided industrial construction, fabrication and maintenance services. Gunn began an apprenticeship for Sanders Brothers. She was able to learn on the job. “Not a lot of companies let people advance,” she explained, “but Sanders Brothers did.” Though she had no formal education in welding before she began working there she said the work came easy for her. Welding is a fabrication or sculpture process that joins materials, usually metals or thermoplastics, by causing fusion. It is different from brazing and soldering, which do not melt the base metal. As a welding apprentice she developed skills in the trade and it helped Gunn understand what a welding environment was like in both shop and field. Welding apprenticeships are offered by companies like Sanders Brothers that weld and construct structural steel, fabricate plate work, heavy machinery and other metal products. They are also obtainable at welding shops and or with welding contractors. Sanders Brothers was a large company with approximately 1,000 employees. Gunn says the company was open to having women and a good shop to work and learn in. Out of 100 workers in her area, there were only about five women in those years. “The company was an industrial contractor, so they had a lot of workers in the field and there were a few more women out in the field.” As a welder apprentice Gunn did a variety of jobs. She cleaned up work sites and set up welding equipment; learned how to operate manual and semi-automatic welding and cutting equipment under supervision; set up and operated hand and power tools; prepared material surfaces that need to be welded; provided support to welders and more. 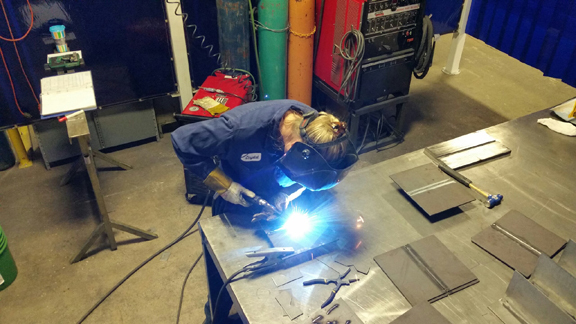 She started practicing welding herself on her break times at work until she was able to be more than a helper, but a full-time welder passing welding certification tests through the company. At the company Gunn worked in sheet metal industrial for HVAC, conveyor systems, and structural pipe. She has now worked with metals in both sheet metal and structural such as sheet metal, carbon steels, galvanized steels, stainless steels, and aluminum. Gunn remained and worked her way up at Sanders Brothers from 1995-2010. During her 15 years at Sander Brothers, Gunn took courses through the National Center for Construction Education and Research (NCCER), which is not-for-profit education foundation developed by construction CEOs, various associations and academic leaders to develop a safe and productive workforce through a standardized training and credentialing program for the industry. Gunn continually moved up in company. In May 1997, she earned her certificate as a Sheet Metal Performance Evaluator certification, a position that helps employees achieve and maintain high levels of work performance. In November 2000, Gunn earned her Weld Instructor certification, which made her an experienced welder with training in advanced welding techniques. With these certifications she was qualified to teach the NCCER curricula of sheet metal fabrication and welding to other employees both in the shop and in a classroom setting on weekends for those wanting to improve their still level. The difference between welding and fabrication, according to a Kaempf and Harris industry article, is basically that welding joins two pieces of metal, glass or thermoplastics with similar melting points and composition using fusion (a singular operation during a process). Fabrication is the evolutionary process of creating a metal product, from a layout or design to formation and finishing (the complete process of a project). Between 2003-2005, Gunn earned certification in Structural Fabrication and Pipe and then in 2005 she became a Fabrication and Pipe Project Manager, responsible for ensuring that projects are completed effectively within cost, schedule, quality and safety parameters. “I knew the closing was coming, but I kept hoping the company would be saved, someone would buy it out or something. When the company shut its doors in 2010, I had been a project manager for about 5 years.” But Sanders Brothers discontinued operations on June 15, 2010. The bank initiated foreclosure proceedings against the company, leaving all of its employees, including Gunn, out of work. When the company closed its door so suddenly, right after she had reached project management, she once again worked as a welder. This time she began working for Bode North America known for custom-built door systems, specifically sliding doors for high speed and light rail trains. She is currently the Welding Supervisor at Bode North America. Bode, a division of German-owned corporation, Schaltbau, which provides comfort and safety for rail and road passengers and smooth seamless processes in transportation of goods. The Schaltbau Group employs over 3,000 people worldwide. It operates major production and service locations in Germany, Spain, Poland, Italy, the United Kingdom, China and the USA. Gunn sees great opportunities in the industry and recognizes that there are some women in the industry, but says it is still a male-dominated industry. This spring, Gunn attended training at Hobart Institute of Welding in Troy, Ohio, with a class of 25. She was one of two women, and the other woman she said was “recertifying as an inspector, but had never been a welder herself.” The class was two weeks with 80 hours of class work. It ended with the completion of three tests that are sent to the American Welding Society (AWS) to grade. Gunn passed the exams and is now a nationally Certified Welding Inspector. She must renew certification every three years along with staying within the field and must re-certify every nine years with 80 hours of accrued class time. The certification gives her a wide base of knowledge of field experience and especially how to use and read the codebook – AWSD1.1 Structural Steel Code. She explained people can certify as a weld inspector within one codebook, but that helps them know how to use and read all welding code books and how to certify the welds. This new certification also allows her to perform some of the duties of a Weld Coordinator keeping up with welds. On a personal level, Gunn, mother of Brandon, 18, and Erik, 10, focuses on her sons. In his sophomore year, Brandon took a welding class and got a new perspective and appreciation of welding, but he told his mom he didn’t want to do it for a living. He is currently a freshman at Spartanburg Methodist College as an art major. Erik, she said, became really interested in nature, animals and natural sciences during a field trip to Barrier Island this year. Gunn says she could see him continuing an interest in the nature field into the future. When not at work, she is and has followed her sons in little league baseball and other activities. She keeps busy traveling to games. Gunn was recently at her home recovering from surgery to repair a peroneal tendon, which tore (this tendon runs under the ankle). She returned and was back on the job by the second week of December. With that in mind, we will continue to follow the career of this hometown girl who has made her career in an industry dominated by males in numbers … and maybe one day we will have a piece of hand-crafted metal art in Jacksonville from our hometown girl who made great strides in a male-dominated industry.